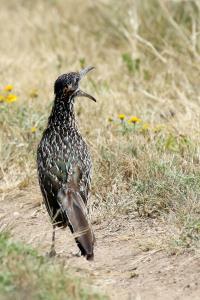 This roadrunner ran in front of me on the Tasajilla Flats trail. He'd occasionally turn and squawk at me for having the nerve to follow him. Temp 72 to start, 88 at end. Overcast then sunny, humid and strong WSW wind. Park personnel have been busy ! Most of the trails have been mowed although Red Dam Loop still needs a trim. The trails are much easier to traverse. While you still have to watch for snakes, now it is easier to do. Speaking of which, a park attendant told me a HUGE rattler had been killed recently - still haven't seen any this year. I saw a fairly large number of Nighthawks flying around. Lots of other birds including a Vermillion Flycatcher, a Painted Bunting, lots of sparrows, Mockingbirds, et al. For some reason I haven't seen many raptors. Water and toilets available at the mid-way point of Roadrunner Loop. Water and shade available at numerous campsites running alongside Roadrunner Loop.